Ref. 1526 ?Small Arabic? Patek Philippe & Cie, Genève, No. 923290, case No. 632177, Ref. 1526, second series. Made in 1943, sold on April 21st, 1944. Very fine and very rare, astronomic, 18K yellow gold gentleman?s wristwatch with perpetual calendar, moon phases, small Arabic numerals with an 18K yellow gold Patek Philippe buckle. Accompanied by the Extract from the Archives. C. Three-body, solid, polished and brushed, concave bezel. D. Matte silver with applied yellow gold small Arabic numerals and dot indexes, subsidiary seconds dial, outer concentric graduation for the days of the month, apertures for the days of the week, the months and the moon phases. Yellow gold ?feuille? hands. M. Cal. 12?? ?-120 QP, rhodium-plated, ?fausses-côtes? decoration, 18 jewels, straight line lever escapement, cut bimetallic balance adjusted to heat, cold, isochronism and 5 positions, self compensating Breguet balance-spring, swan-neck micrometer regulator. Dial, case and movement signed. Diam. 34 mm. Thickness 11 mm. C. Three-body, solid, polished and brushed, concave bezel. D. Matte silver with applied yellow gold small Arabic numerals and dot indexes, subsidiary seconds dial, outer concentric graduation for the days of the month, apertures for the days of the week, the months and the moon phases. Yellow gold feuille hands. M. Cal. 12-120 QP, rhodium-plated, fausses-côtes decoration, 18 jewels, straight line lever escapement, cut bimetallic balance adjusted to heat, cold, isochronism and 5 positions, self compensating Breguet balance-spring, swan-neck micrometer regulator. Dial, case and movement signed. Diam. 34 mm. Thickness 11 mm. Ref. 1526 Produced in 210 examples from 1941 to 1952, with the Caliber 12?? ?-120 QP, the majority in yellow gold, rarely in pink gold, with only one example known to date in stainless steel. - First series with indirect center-seconds produced in very few examples. One of these watches was sold by Antiquorum Geneva in the thematic auction ?The Art of Patek Philippe?, April 9, 1989, lot 203. - Second series with concentric subsidiary dials for the seconds and the days of the month. The dials for the second series of this reference are known to date with 3 different designs: - the seconds division scale on the outside of the subsidiary date dial are quite rare - the seconds division on the inside of the subsidiary dial - the seconds division only on the bottom portion of the subsidiary dial, below the moon phase aperture. The applied gold upright Arabic numbers are of two kinds: - the larger type, more common - the smaller type, as the present watch, much rarer. 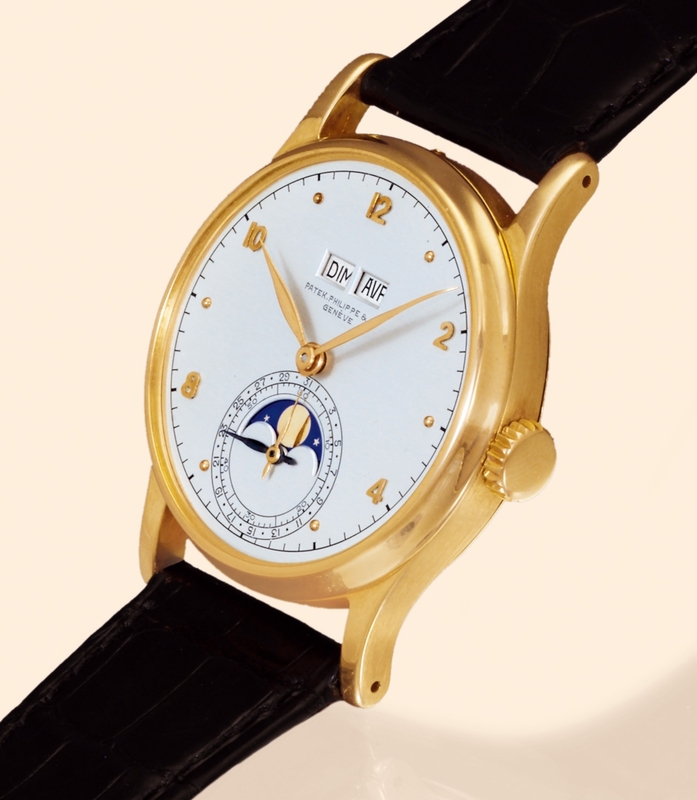 A similar watch is published in Patek Philippe Wristwatches, by Martin Huber & Alan Banbery, 1998 Edition, pp. 282-283.